Logistics companies have high demands on the degree of automation for their processes. No matter whether it appertains to sorting, incoming and outgoing inspection, material flow, storage, order picking or optimal utilization of transport capacities: The basis for optimizing logistical processes is the automated capture and processing of product-, package-, and customer-related data – easily, efficiently and transparently. This includes reading of addresses, barcodes, 2D-codes and customer-specific codes as well as the volume and weight of a consignment. The captured data is transmitted to warehouse management or customer relationship management systems and can be used for further customer- or object-related processes. 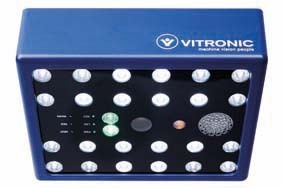 VITRONIC Auto-ID systems capture and analyze all relevant information such as bar codes, 2D-codes, customer-specific codes and plain text (OCR) – even several different code types in one image – on up to six sides of different packages. The orientation of the package makes no difference, text and codes are captured even behind foil. Flexible operation according to your needs. 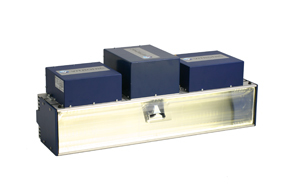 Permanently installed autofocus line-scan cameras are integrated into the automatic process in conveyor systems. Data is captured inline on up to six sides of packages. VIPAC systems can be installed at any position along the entire process chain – including volume measurement, recognition of deformations and weighing – and guarantee maximum read rates. VITRONIC not only supplies components, but also plays an important role as a consultant for realizing projects and delivers the right solution for every application – from hardware to software. In the past years, VITRONIC successfully implemented numerous systems at well-respected and internationally renown customer’s sites. The systems are used by courier, express and parcel delivery companies, mail order companies, companies from warehousing and distribution as well as in the manufacturing industry for data collection along the entire process chain. Besides the camera-based systems for the logistics division, the systems are also in operation for industrial automation and traffic technology. 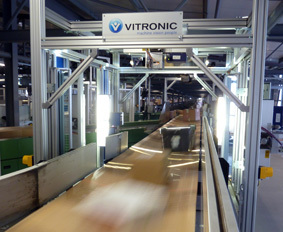 VITRONIC, head office in Wiesbaden, was founded in 1984 and is one of the worlds’ leading industrial machine vision companies. VITRONIC has a workforce of around 500 people on four continents, our products are currently in use in 40 countries.